So I shared this meme today on my Facebook page. 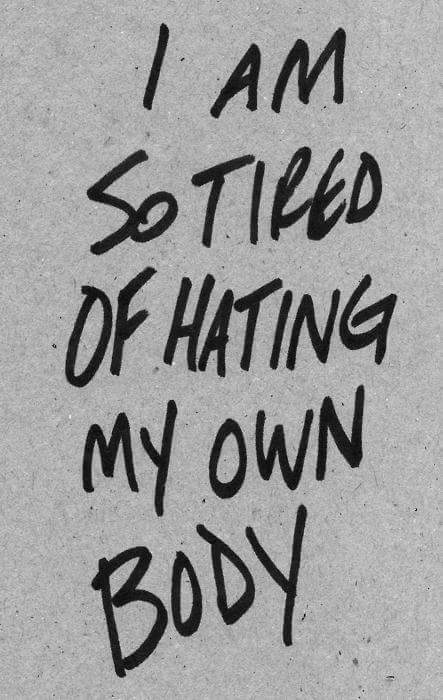 An acquaintance asked why do it then, as in why hate my body. I answered that I can’t help it sometimes. I’ve waxed all philosophical about it and decided I needed to write an actual blog post about it. As the title alludes to, there is a lot of fear and loathing involved in my relationship with my body. It’s never been an overly healthy thing. That’s the toss up for hopping out of the womb three months early and surviving, I guess. I caught pneumonia for the first time at one week old. For all the sickness I had as a child, none of it was a disability. My body generally worked, my immune system was just crappy. I think I was seven or eight the first time my knees started to ache. Younger for the first angry colon/bladder incidents. It still wasn’t until I was thirteen or fourteen where things really started to fall apart. I remember trying out for track and field at my new elementary school, having just moved to Surrey. As I sprinted across the field, fully expecting my legs to piston as always regardless of pain, the first real fear moment struck. It didn’t hurt a lot, my knee just refused to take my weight, and into the gravel I went. It would take a few years of debilitating knee pain for the loathing to start. When your body hurts every day, for no particular reason, you eventually start feeling pissy with it. This acquaintance, like a lot of people who don’t live with chronic pain, says I always have a choice in how I view my body. In reality, I really don’t. Chronic illness and pain do a number on the brain chemistry. So while sometimes I can pull myself out of the more, a lot of the time I can’t.